There are now just over 1,000 in the water with a good head of fish over 20lbs. At least twenty have been caught over 30lbs, three of these have been caught at over 40lb. The waters have produced big pike in the past and there are a number of good bream in the waters that have been caught to over 15lb. Tench to over 11lb along with roach and rudd close to 3lb have been caught in recent years. Joined together by a narrow channel these two waters provide some first class fishing and contain some very pretty carp which were selected intentionally for the waters. Linear estimate the carp stock to be just over 1,000 fish with a high number of these in excess of twenty pounds in weight. There are at least 20 over thirty pounds and over the last four years fish to over 40lb have been recorded. 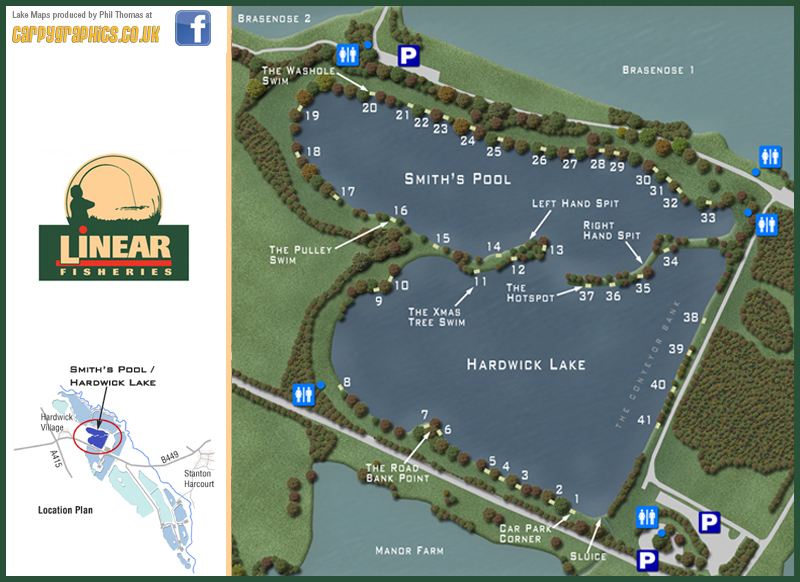 The lake record for a common carp is 39.14, for a mirror it is 43.10 and for a ghost carp it is 25lb. It is Linear's policy to regularly stock this water. over 15lb, tench to 11lb plus, and roach to 3lb 15oz. During the last couple of years, we have had reports of two catfish being caught from the water, these fish shouldnt be there and probably moved as small fish back in 2007 during the summer floods. We have a temporary licence with the EA but they must be removed from the water when caught. If anyone lands a cat from the water, please retain it in their net a contact one of the fishery team. Please note that the main Hardwick car park is now locked after dark and like our other car parks your vehicle will now be locked in at nights.